This vow renewal package is affordable, easy and fun. 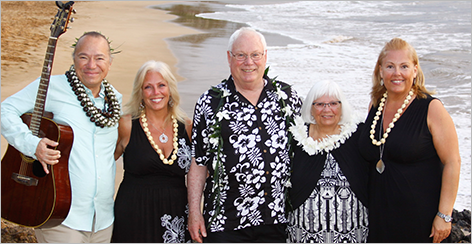 Maui beaches or garden location ceremonies make this experience memorable and it begins a new chapter in your married lives, especially when you add your own vows to the ceremony! The morning ceremony offers blue water and skies and you have the whole day to celebrate. A sunset ceremony offers those amazing colors we all dream about, which can be followed by dinner reservations that you can make with one of our fabulous restaurants. Come on get Re-Maui’d! You will be glad you did and enjoy your relationship in a new way. The Aloha Ceremony is for couples who want to get married on Maui without all the frills in an easy, affordable and romantic way. Maui Hawaiian style weddings are beautiful and unique, I am sure you will be pleased and very happy you came to Maui to share your wedding vows. 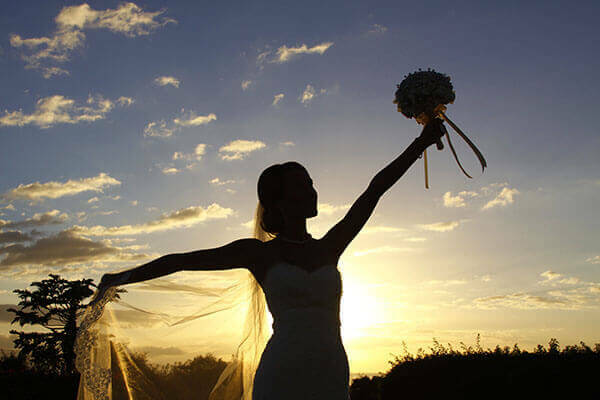 A Sweetheart Maui wedding is a very popular choice and an affordable Maui wedding package offering more photography, a bouquet for the bride and a keepsake sand ceremony with a glass bottle to fill with colored sand making a wish for your future together. 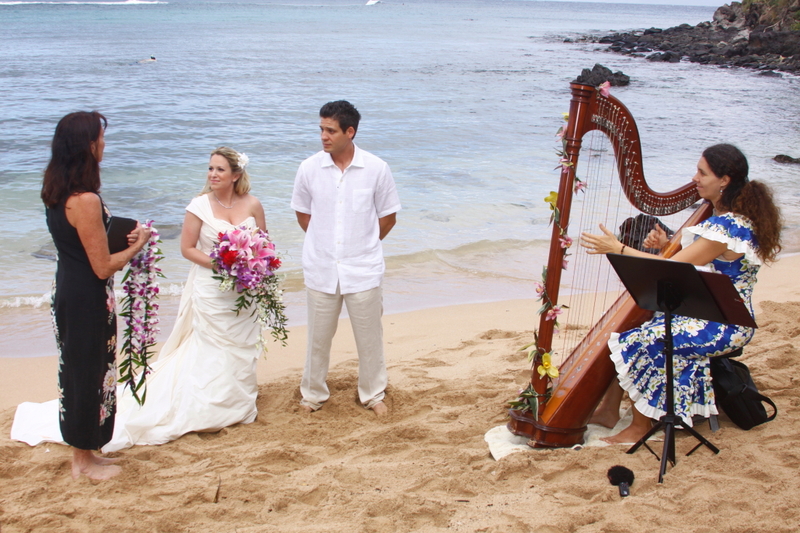 This Maui wedding can be done at either morning or at sunset on a beach of your choice. 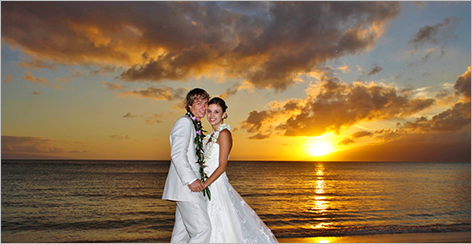 The Romantic Maui Sunset package is for those couples who want more of a Maui wedding experience. A musician to serenade you in the ceremony adds to the heartfelt & sincere feelings you have for each other. The engraved toasting glasses are a nice keepsake and they add a nice touch to the already large photography package. And of course a stunning bouquet for the already beautiful bride. Come make this Romantic Maui Sunset ceremony happen for you. Along with an online link for you to share with your family & friends. A Simply Maui’d wedding package is for those with a sweet tooth, it comes with a wedding cake to be enjoyed after the ceremony with dinner. It also has a bridal bouquet and engraved toasting glasses for a special keepsake to take home. The sand ceremony is a fun thing you do together pouring colored sand into a glass bottle with your wishes for the future. 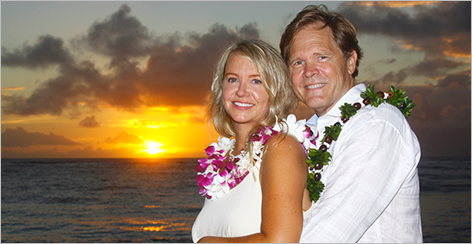 Daytime Delight is a wonderful Maui wedding package that has it all. 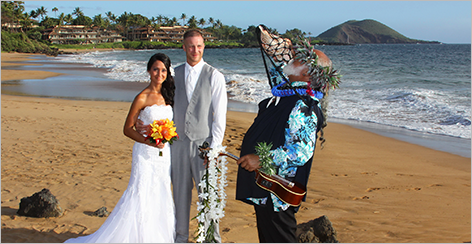 You will not only have all the basics but also a musician to serenade the ceremony, along with an edited video to share with family & friends that cannot be on Maui with you. Plus the fact that the morning or day time lighting gives a really rich look to your images & video. And because you are done before the dinner hour you can enjoy your celebration at a Hawaiian Luau, a dinner cruise on the ocean or at one of our fabulous restaurants.